HENRÉE ALYSE (Catherine) is a graduate of Maggie Flanigan’s two year Meisner Conservatory. She has appeared Off-Off-Broadway as Juliet in ROMEO AND JULIET at the John Houseman Theater, as Hanako in HANJO by Yukio Mishima at the Native Aliens Playhouse and as Geraldine in WHAT THE BUTLER SAW at the Pax Amicus Castle Theater. Henrée played Nurse Carol on “All My Children.” She has a national “Truth” commercial running as well as a Rubbermaid commercial running at all Footlockers nationwide. Henrée has just finished shooting the films ”Dress Rehearsal” by Ryan Aynes/United Artists, “Second Hand Smoke“ by Hamish Berry NYU-SCPS, “Beyond the Bathroom Door” by Elise Bennett, starring Heather Tom, and a spec commercial for Monster.com. Henrée is honored to be playing the part of Catherine with such a wonderful director and an amazingly talented cast. She would like to thank all her friends and family for being so supportive. 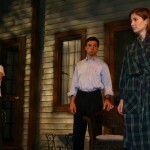 JESSICA ELLWOOD (Claire) is appearing for the third time with the Hampton Theatre Company. Last spring she played Alice Sycamore in YOU CAN’T TAKE IT WITH YOU and, the year before, Nellie in Tennessee Williams’ SUMMER AND SMOKE. Other roles include Susy in WAIT UNTIL DARK, Artie in ELEEMOSYNARY and Rosalind in AS YOU LIKE IT. Jessica teaches 8th grade English in Southold, and she thanks her husband Paul for his love, patience and encouragement. RICK IMBERMAN (Hal) is pleased to return for his second appearance with the Hampton Theatre Company after playing George in the company’s production of ALL MY SONS. Some of his favorite roles include Joe in GOLDEN BOY (Playwrights Horizons), Dr. Benjamin in WAITING FOR LEFTY (The Actors Studio), Epstein in BILOXI BLUES, Rodolpho in A VIEW FROM THE BRIDGE, He in HUNTING COCKROACHES, Danny in SEXUAL PERVERSITY IN CHICAGO and Billy in the premier of Larry O’Connell’s ON DANGEROUS GROUND. 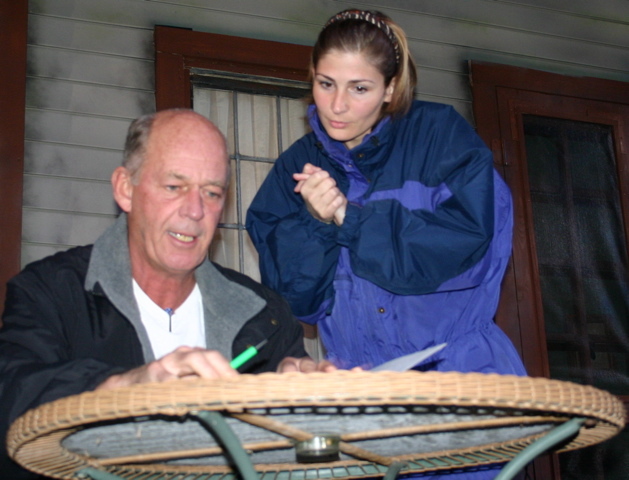 Rick is the Founder and Artistic Director of The American Art Theatre Actors Workshop, offering professional classes to Long Island actors. He is a graduate of NYU’s Tisch School of the Arts. LARRY NICKS (Robert) is happy to be working with Hampton Theatre Company once again. 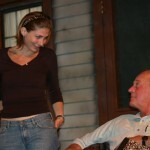 He played Dr. John Buchanan, Sr. in the company’s production of SUMMER AND SMOKE at Guild Hall. He has also appeared in the two character comedy CARIBBEAN COUPLES at the Harold Clurman Theater in NYC. Before that, he did other Off-Broadway and regional work along with the Broadway show HEARTLAND in which he starred with Sean Penn and J.C. Quinn. 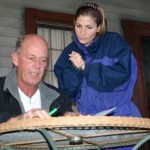 Larry has also appeared as a principal in more than 40 commercials. DAVID AUBURN (Playwright) attended the University of Chicago where he studied political philosophy and where his formal mathematical education ended with calculus. After college and a brief stint writing ad copy for a chemical company, he studied acting and writing at Juilliard. PROOF is his second full length play. 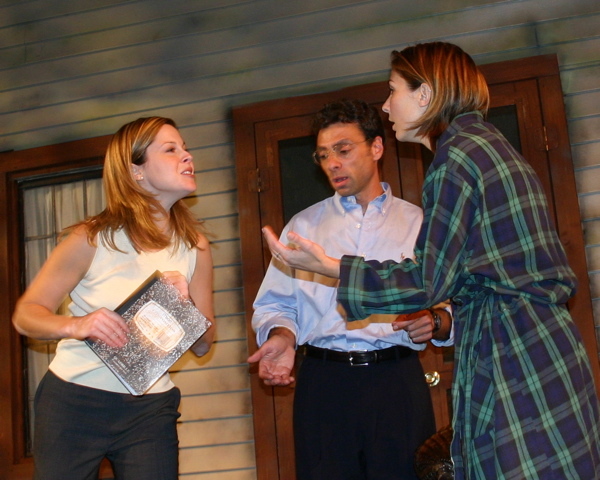 The first, SKYSCRAPER, was produced Off-Broadway in 1997. 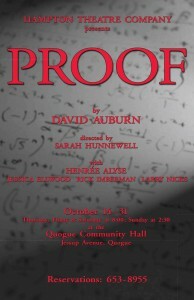 PROOF won the Joseph Kesselring Prize, the Pulitzer Prize, the Drama Desk Award and the Tony Award for Best Play of 2001. Mr. Auburn is currently working on two projects, one on the Spanish Civil War and the other on twentieth century spiritualism (including Houdini). A Chicago native, he now lives with his wife in Williamstown, Massachusetts. SARAH HUNNEWELL (Director, Producer) is the Executive Director of the Hampton Theatre Company and has, at various times, produced, directed and acted for the company for the last fourteen years. Favorite directorial forays include SUMMER AND SMOKE, THE RAINMAKER, A VIEW FROM THE BRIDGE, ORPHANS and THE LAST YANKEE. Many thanks to her wonderful cast for bringing this terrific play to life and, as always, to Jimmy for his help and support. DIANA MARBURY (Producer, Set Decor) is the Artistic Director of the Hampton Theatre Company and has worked in many capacities with the company over these twenty years. At the beginning of the HTC’s 20th season, she would like to pay homage to June Ewing, who persisted with her dream of bringing theater to local audiences, against all odds, and whose vision has continued to inspire us… we who carry on the torch. PETER MARBURY (Set Designer) is the resident set designer for the HTC. He has managed, on a small budget, to recreate myriad environments including Victorian parlors and Cape Cod beaches. When not creating sets, Peter can be found in his studio, where he busies himself making sculpture. For relaxation, he grows vegetables in his garden. SEBASTIAN PACZYNSKI (Lighting Designer). Originally from Poland, Sebastian now lives in Brooklyn where he works regularly on industrials, trade shows, independent films and features such as “June Roses” and “Hero Man”. 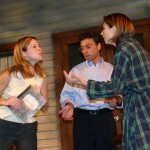 His theater designs have been seen Off-Broadway at Here Performance Space as well as at a number of Off-Off Broadway venues downtown. 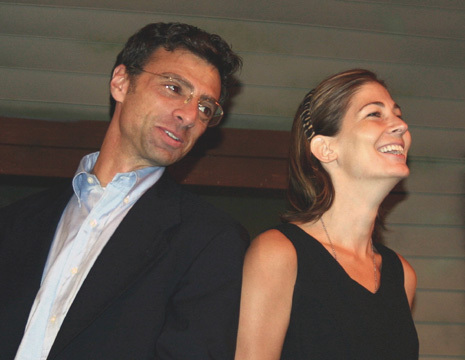 Sebastian designed JULIUS CAESAR, MACBETH and GHOULED HALL and was Master Electrician on ROMEO AND JULIET at Guild Hall and has worked with the Hamptons Shakespeare Festival. TERESA LEBRUN (Costume Designer) has been with the HTC off and on since the company’s 1987 production of ANASTASIA and most recently costumed last spring’s productions of SUMMER AND SMOKE and DEATH DEFYING ACTS. She has done everything from hair and make up and costumes to backstage crew, assistant stage managing and refreshments. Teresa is happy to be working on this production doing her first love as a costumer. Much love and thanks to her boys Joshua and Noah for sharing her with the HTC. JOHN ZALESKI (Stage Manager) is a veteran of backstage tech and set design for over 80 productions, working with numerous theater companies on the East End since the late 80s. 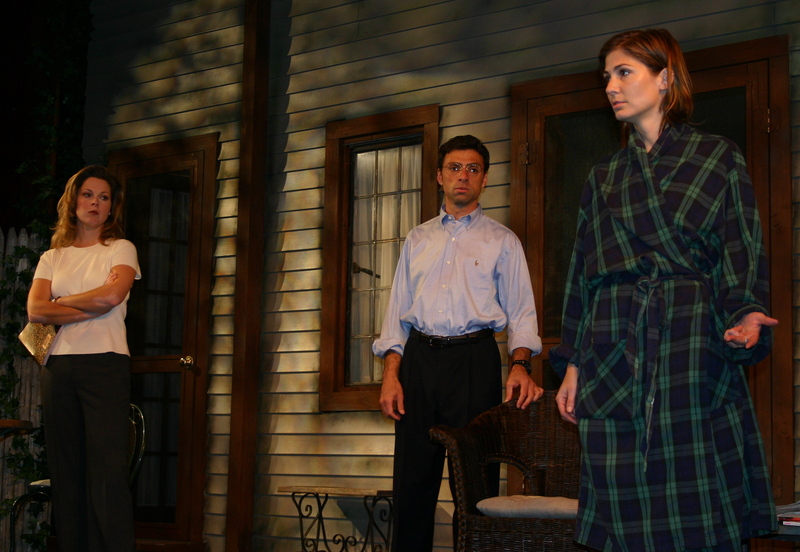 John is pleased to again join the Hampton Theatre Company for their long awaited return to the Quogue Theater. 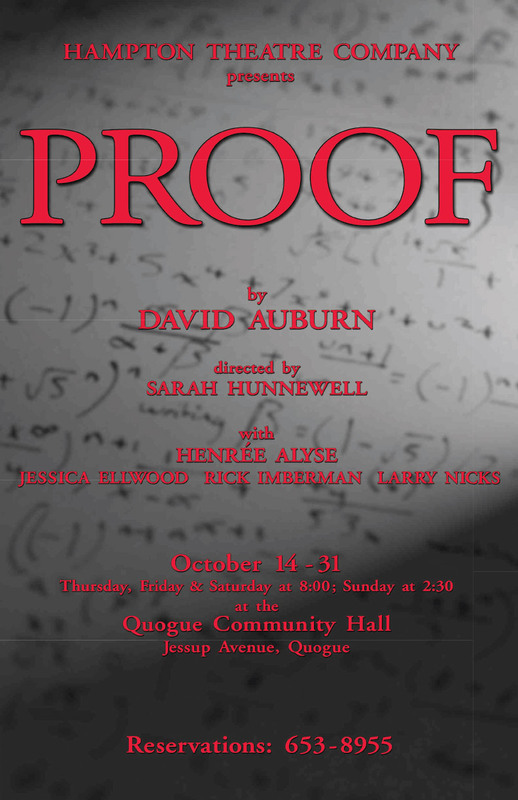 “Thank you” to the wonderful cast and crew of PROOF. KRISTIN SINKEL (Assistant Stage Manager) has worked with the North Fork Community Theater, Oddfellows Productions, and Women’s Voices, Women’s Lives, as well as with the HTC and has appeared in several productions with the Southampton Players. In “real” life, Kristin works at the Veterinary Clinic of East Hampton .